Carpet Bright UK understands the investment you’ve made in the upholstered furniture you’ve chosen, creating a comfortable and welcoming environment for all the family, adding character and individuality to a room and allowing you to express your own personal style. So it’s a shame when the fabrics around you become tired, dingy, dirty and even unhygienic. Such wear-and-tear is inevitable over time and with a growing family – but Carpet Bright UK can help restore the fresh-smelling, attractive and safe environment you want your home to provide. A simple maintenance regime from Carpet Bright UK can prolong the life of your upholstery as well as keeping the place you live in healthy and welcoming for all members of the family. We aim to help our customers re-capture that just-like-new crispness of their upholstery – and we’ve seen over and over again the difference a deep upholstery clean makes to a room. Soft furnishings come in a wide variety of fabrics, materials and construction methods, so one cleaning process definitely does not fit all! Your Carpet Bright UK technician will be able to recommend the right way to carry out a really effective, deep-down clean using the most thorough and modern upholstery cleaning methods. For upholstery work we will always send out an experienced technician who knows exactly how to clean your speciality fabric. Before any cleaning takes place, he or she will always thoroughly inspect the furniture's fibre to determine its type. Once we've fully determined the fibre content, we will be able to safely deep steam clean your furniture. Stain Removal - All of our stain and spot cleaning skills produce stunning results. Across London and South East, we have dealt with and removed thousands of stains, whatever the type. Perhaps this is why, when it comes to stain and spot removal, customers regard us as the best. Dust Mite Removal - Carpet Bright UK understands how important your family’s well-being is to you. Hayfever, asthma and other allergies can make life uncomfortable and in some cases almost unbearable. Our specialist product for removing dust mites is not only highly efficient but keeps the environment safe for family and pets. Water Staining - Accidents will happen, so in the unfortunate event of water damage or other liquid spillage, our expert technicians are on hand to advise on the cleaning solutions available. Deodorising & Odour Removal - Over half the UK’s households are now pet owners – and we all know what can happen to a pet dog or cat’s favourite armchair. Carpet Bright UK’s technicians are trained in the removal of contaminants, stains and odours on fabrics and furniture. Our micro-bacterial removal and sanitisation methods will quickly restore the freshness of all your upholstered furnishings. Contact Carpet Bright UK today to talk about the benefits of our professional upholstery cleaning service and to book a consultation with one of our team. 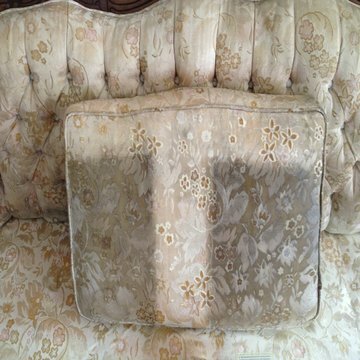 The highest quality of service from our upholstery cleaning technicians. Our upholstery cleaning equipment is fully up-to-date. 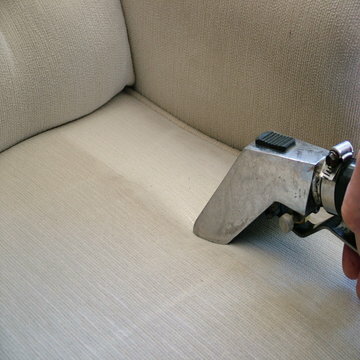 To offer our clients the best upholstery cleaning ever. We've been voted #1 upholstery cleaner in London, Kent & Surrey. We've served over 9,000 happy upholstery cleaning customers in the UK! 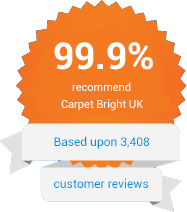 "We are really happy with the level of clean from Carpet Bright UK, our Upholstery looks and smells new again.